News and Commentary on Sierra Leone from around the web. Appearance on this list does not constitute responsibility for or an endorsement of the content of listed websites. Managing Director: Lord Bannister Koroma Sierra Leone news from APC. Editor: Kelvin Lewis Sierra Leone news. Editor: Rev. Leeroy Wilfred Kabs-Kanu Sierra Leone news. Executive Publisher: Dr Ibrahim Seaga Shaw Sierra Leone news. Managing Editor: Jonathan LeighnEditor-In-Chief: Bai Bai Sesay Sierra Leone news. Managed by Mano Multimedia (SL) Limited. Sierra Leone news. Editor: Gibril Gbanabome Koroma Sierra Leone news. Publisher: Free Media Group Sierra Leone news. Editor: Sahid Khan, Jr. Sierra Leone news. Publisher & Editor: Abdul Rashid Thomas Sierra Leone news. Editor-In-Chief: Adeyemi Paul Chukwu Sierra Leone news. Editor: Philip Neville Sierra Leone news. Editor:Sheka Tarawalie Sierra Leone news. Editor: Alusine Sessay Sierra Leone news and entertainment. Editor:B. W. Bockarie Sierra Leone news from SLPP. Editor: Patrick Smith A subscription-based fortnightly newsletter covering politics and economics inAfrica. It was established in 1960 and is owned by the British company Asempa Limited. Africa Economic Analysis is an independent, UK-based, non-profit organisation Collection of blogs and articles by African authors. Founder: Sean Jacobs Blog is a reaction to old and tired images of Africa and a collective of scholars, writers, artists, filmmakers, bloggers, and curators who together produce online commentary, original writing, media criticism, short videos, and photography. Online news African news and blog aggregator. African news website, video and webcasts by the British Broadcasting Service. Think Africa Press Editor in Chief: James Schneider Online magazine on global African news coverage. Database of electronic journals focused on Africa within the fields of humanities, social sciences, politics and economics. Founder:Peter C. Andersen Actively managed website with many resources and links reflecting life in Sierra Leone today, and in history. Prepared by Karen Fung for the Information and Communication Technology Group (ICTG), African Studies Association, USA. 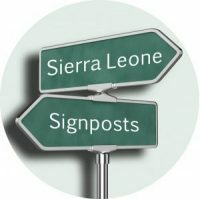 Listing of news websites related to Sierra Leone. Founder: Miss Sallah Unchain Africa Press is a collective of scholars of African Diaspora descent. Editor-in-Chief: Ahmed Sahid Nasralla Africa Young Voices (AYV) is an entity established in Sierra Leone for the promotion and development of youth activities in the country and the Diaspora and media advocacy and entertainment. Director: Andrew Quinn New Voices Fellowship initiative which aims to train and support a new cadre of experts from developing countries to communicate effectively and play a larger role in championing solutions and setting priorities for global development work. Contributing Author: Herbert M'cleod OpenOil is an energy consultancy and publishing house based in Berlin, publishers of Oil Contracts 2013 how to read and understand them in late October 2012 produced in just 7 days using the booksprintmethod. Available for free download. Board Member: Herbert M'cleod Independent, non-profit center for business and human rights practice, helping governments, businesses and their stakeholders put the UN Guiding Principles on Business and Human Rightsinto practice. Advisory Group Member: Herbert M'cleod SLIP is Irish Aid's Expert Advisory Group, advising the Deputy Prime Minister on the Irish Aid programme. Ireland has included Sierra Leone among the 9 focus countries for its development aid programs. Irish Aid focuses on addressing global hunger and building resilience; climate change and human rights; improving gender equality and disability; and transparency and accountability. Managing Director 2013: Jesmed Suma Nonprofit public policy think tank, blog and discussion forum. The Sierra Leone Transformation Working Group (SLTWG) The Sierra Leone Transformation Working Group (SLTWG) is an independent non-profit organization whose primary objective is to support the transformation of Sierra Leone into a peaceful, prosperous and stable middle-income country by 2035 and beyond. Blog for the SPPKH. The Society for the Preservation and Presentation of Krio History (SPPKH) is an organization established by Akindele Decker, Nigel D.D. Davies, and Effie O. Johnson to increase awareness to well-known and neglected aspects of Krio history, heritage, and culture.